Sometimes I just have TOO MUCH FUN creating! I did one more for the sketch challenge (see my 5/14/14 post). In 2006, my mom took me on an Alaskan cruise for my birthday, and to fulfill her own dream of taking a cruise to Alaska. 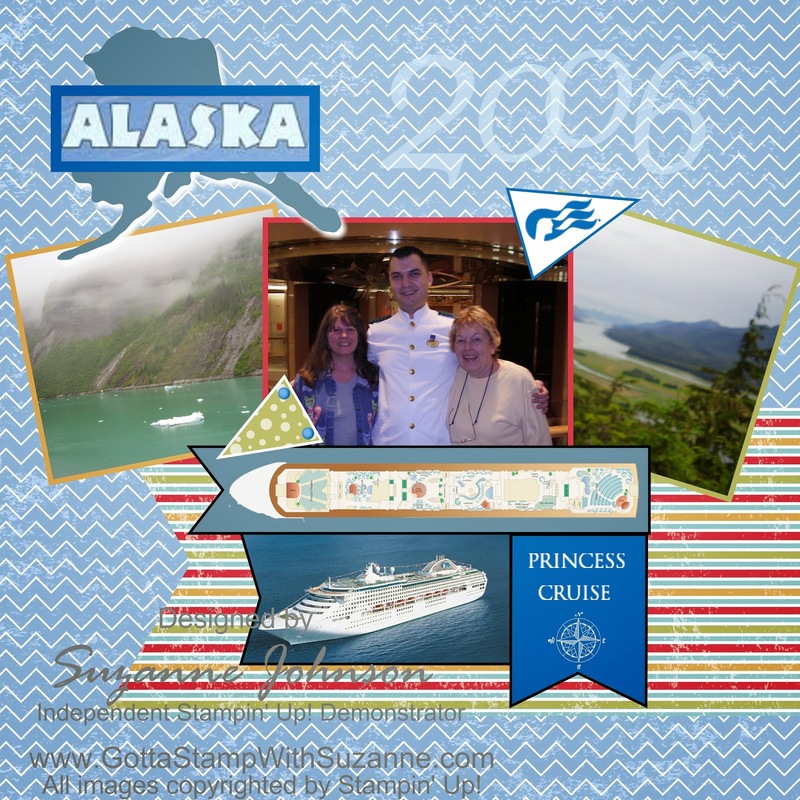 It was also a stamping cruise (but not with Stampin' Up! which would have been WAY better!) Stamping aside, we had the best time on all the port trips. My Digital Studio elements include On the Go DSPs (background added as a page layer and recolored), Flag, Mini Flag Banner, Petite Pennant and Nifty Fifty Alaska punches, Brads (recolored), Compass stampbrush from The Open Sea, and Love Birds Numbers stampbrush. I pulled the deck diagram, ship photo and Princess Cruise logo from their website and used the photo-fill tool for the ship in the banner. The diagram was overlayed and saved as a group with that banner, as were all the elements on the Princess Cruise banner. That looks like a really fun trip! I love the bits and pieces of the cruise ship logos and layout that you added. Your hard work at MDS is paying off. Thanks again for joining MDS Monday. Thank you Heidi! I had a lot of fun designing this - I've always planned to do a scrapbook about this trip and this may be what I needed to finally get it going! I have a few other MDS creations on my MDS page, and samples I've posted are tagged MDS. Is that Three for this challenge? and all look so different. Isn't it great that you can use one sketch and really make such different projects. Love that you used the cruise ship layout photo in your page. Yes, Beth, that's three! I was waiting to find out how to resolve a technical glitch with the link on one of the first two and got to creating this in the meantime. I love how something as basic as a layout can be the inspirational gateway to infinite possibilities! All the submissions on MDS Monday are so awesome! Thanks for keeping memories of our trip alive with this creative and attractive scrapbook page. Thank you Tara and Mom! This was a fun page to create and enjoyable to relive the great memories of this trip.